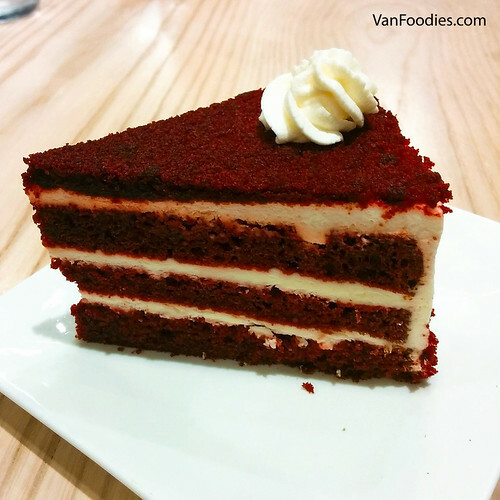 Mr. is a huge red velvet fan so we shared a slice of the Red Velvet Cake. The sponge was airy; and I liked the even layers of cake and frosting. It wasn’t as rich and heavy as I thought it would be, but I would’ve liked more cream cheese flavour to make it more “red velvet”. 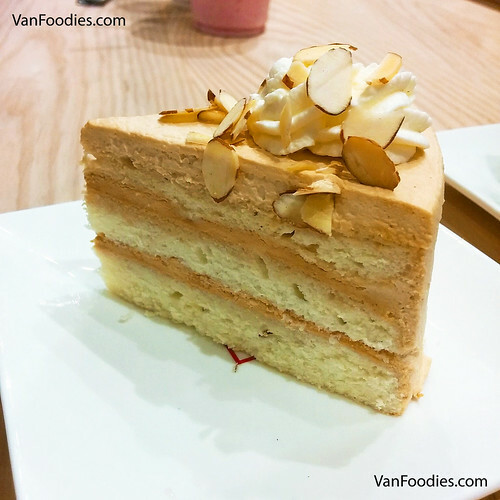 I tried LH’s Earl Grey Cake. It looked exactly like the Red Velvet, except it’s vanilla sponge with earl grey frosting. It’s slightly sweeter, cake a bit denser, and the frosting had prominent earl grey flavour. I quite liked this, and I prefer this over the red velvet cake. I also tried the Matcha Mousse. 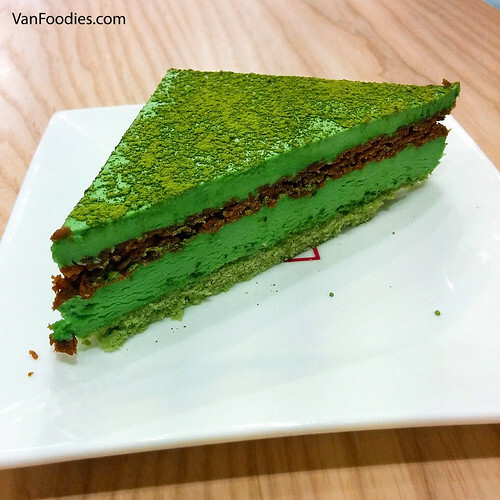 Matcha and red bean is a classic pair; the red bean layer in the middle was mixed with crispy wafer, which added crunch and texture to the creamy mousse cake. 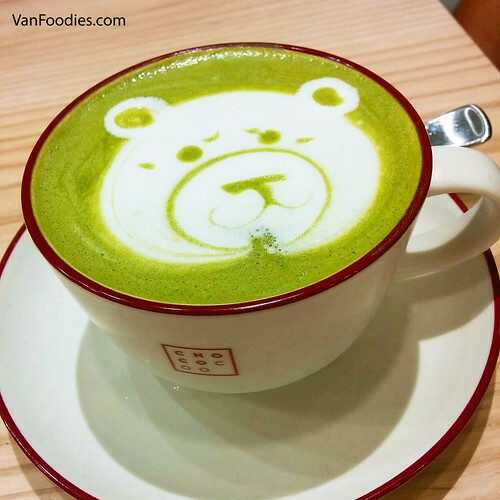 If you like matcha, you should order this. 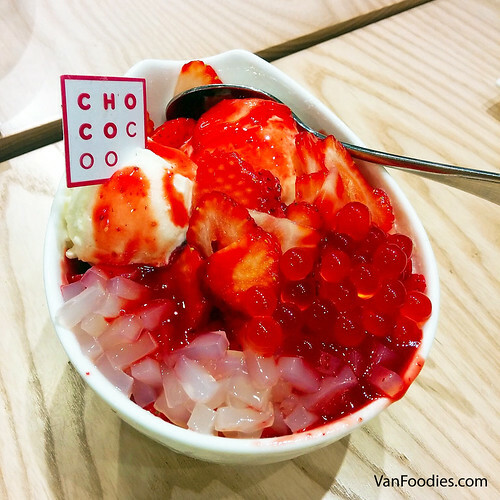 CL and IY ordered the Strawberry Shaved Ice. I didn’t try it but it sure looked delicious. It didn’t look like much at first glance, but it was in fact loaded with strawberry poppers, coconut jelly, strawberries and ice cream. Of course, milk-based shaved ice. CL and IY seemed to quite enjoy it. It was around 9pm on a Sunday evening, and it wasn’t too busy. There were only a couple other tables occupied. There were 9 of us and we were able to form our long table right away. If it were busier, we would have to sit separately or give up and try again another time. This isn’t a counter-service cafe. They take the time to prepare your drinks, your desserts, and bring your order over to you. We didn’t wait too long for ours, but if the cafe is busy, it could take some time for your order to arrive. 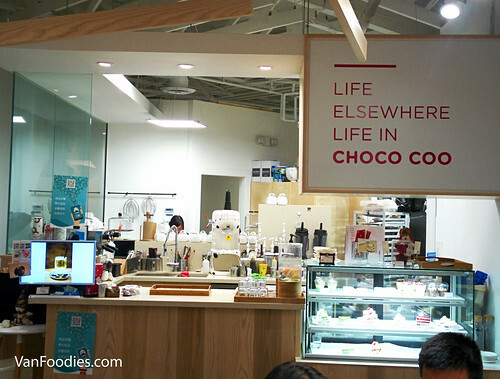 Overall, I like their style of desserts. They are not too heavy nor were they loaded with sugar. Most cakes are $6.25 per slice. Not overly expensive but probably not something I would go for all the time. 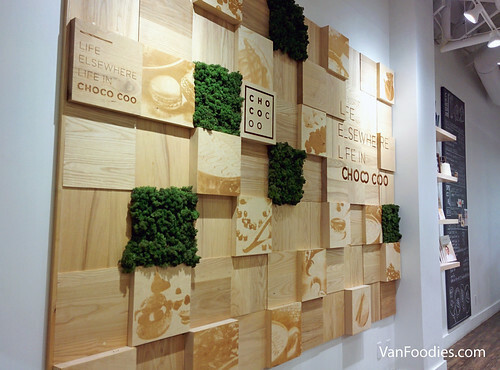 The decor at Choco Coo is so on trend. 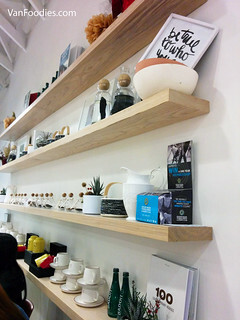 Simple, white wall, wooden shelves and furniture. I really like the interior design. It would make a great “off-site” office space as well as hang out space for a small group of friends.